Special Containment Procedures: Foundation personnel are to disguise themselves as security guards and are to monitor the "Tower of Winds" historical landmark. As a result of the common knowledge of the monument, civilian access is allowed, however, only through guided tours by Foundation personnel. There is to be a checkpoint located near each of the two entrances of the monument to prevent any individuals from defacing or destroying anything inside the structure. Bullet-proof glass lined with graphene is to be placed across the various murals inside the tower to prevent from any hostile-entity interacting with them. The keyholes that are located within the building are to be filled with concrete as to ensure that the murals are never completed. Foundation personnel are to capture any hostiles that attempt to reach the inner sanctum of the tower. Due to the inherent differences in the effects of Eos-type1 by the events caused by SCP-3921, separate containment procedures are outlined below. Foundation personnel are to occupy various meteorological observatories centered around the Arctic Circle in the Northern Hemisphere and to monitor weather balloons focused anywhere above 45°N. If instances of SCP-3921-α are reported by personnel not during the typical designated interval, they should report directly to Foundation Site-18. Members of the public where SCP-3921-α occurs will be evacuated under the pretense of deadly blizzard conditions. In cases where the citizen is not willing to leave their residence, non-lethal force and the use of amnestics to forcefully evacuate them are approved due to the danger of contact with SCP-3921-α. Foundation personnel will expunge any data regarding considerable windstorms that occur annually on February 11th. Further containment procedures of Amber-Level events is still under development. Currently, due to the event's anti-memetic properties and low damage threshold, it is presently low-priority for any further containment additions. Foundation personnel are to monitor meteorological forecasts and immediately report any occurrence of unusual cloud formation during the month of January. When an instance of SCP-3921-φ is reported, the designated Mobile Task Force will respond to the region that is to be impacted. Drones with infrared capabilities are to scan the area and aerially disperse sleep-inducing compounds due to the need for swift evacuation of the surrounding area. Foundation personnel will then procure the residents and place them in a secure location. After the conclusion of the event, residents will be given amnestics and a cover story of a carbon monoxide leak will be used as a pretense. Simultaneously, foundation personnel will dissipate bromomethane to terminate all insects, rodents, and fungi in the area. Sulfometuron methyl will be used to terminate trees and vegetation in the area. The termination of all life-forms in the area instead of standard relocation (as used in Turquoise-Level Events) is due to the rapid onset of the event and the particular danger of this event's mutagenic properties. At the conclusion of the Verdant-Level Event, all vegetation shall be replanted and appropriate animals and insects relocated to repopulate the area. Description: SCP-3921 is a set of eight incomplete stone carved murals located in the main altar room of the Tower of Winds monument located in Athens, Greece. The tower has one main, octagonal room that is approximately fifteen meters in diameter. Every wall of the room has an elaborate mural depicting the Greek gods of wind, each of whom were assigned a cardinal direction to govern over. The group of eight deities as a whole are commonly known as the "Anemoi." Each mural’s center consists of a block that is jutted out of the rest of the mural’s image, marking the image as incomplete. Each block contains a pictographic image of a weather related event that is associated with its respective god. All the blocks contain an aperture within which a specific key needs to be placed in order for it to be pushed into the mural, thus completing the image. The keys will from now be known as SCP-3921-1. Mural Description: Aquilo is pictured as a disheveled man with long hair that is flowing to the sides of his shoulders. He is also wearing a heavy set cloak with the words “Septentrio” emblazoned across the cloak’s chest. In one hand, Aquilo is sounding a conch shell and in the other he is holding a reign which is attached to twelve horses. Each horse has several cuts and scars which are discharging blood. Notes regarding Key: Found in the crypt of Andronicus of Cyrrhus in the ruins of the ancient Macedonian city of Hagioupolis in 1793. Used to activate mural initiating the Turquoise-Level Event. Key is made of Lapis-Lazuli and head is designed in the shape of a snowflake. Currently in Foundation containment. Mural Description: Zephyrus is a middle-aged man wearing a royal mantle and a crown. He is standing at the edge of a cliff pointing out to an ocean that is aside of the cliff. Following the direction of his finger is a single line of humans who appear to cyclically walk off the cliff face. Notes regarding Key: Currently in the possession of the ORIA. Records indicate key was located in The Library of Hadrian in Athens up until 1461. Ottoman conquest of Attica in 1460 led to its disclosure and acquisition by the Ottoman government forces. Has been in ORIA containment since 1904. Details on features of the key have not been available. However, records indicate that when government officials transported the key from Athens to Constantinople it had to be enclosed by a large cubic steel container. Mural Description: Auster is depicted as a young man with long hair covering his face. Multiple copies of Auster are holding hands while circling a tree. There are also numerous clouds raining hail. Notes regarding Key: Unlike the other murals, Auster’s corresponding block has seven keyholes. Four of which are currently in Foundation containment. The keys have no unusual qualities. Mural Description: Vulturnus is completely shrouded in a cloak making his features unidentifiable. He is sitting in a meditative position in the caldera of a volcano. Notes regarding Key: Key has currently not been found. Mural Description: Apeliotes is depicted as a young teenager with curly hair. He is wearing a traditional Greek chiton and is barefoot. He is spreading seeds on the ground of a farm. Along with this, cows are also shown grazing on the farm field. Notes regarding Key: Currently missing. Key had first appeared when POI-7543 entered the Tower of Winds disguised as a tourist. POI-7543 then successfully broke the containment barrier surrounding the Apeliotes mural. Foundation personnel successfully terminated POI-7543, however, the moment the blood of POI-7453 contacted the key, an exact copy of POI-7453 started to emerge from the head of the key. This copy then successfully activated the Apeliotes mural, which initiated the Verdant-Level Event. During the subsequent earthquake, the copy of POI-7453 escaped with the key. According to the after-report, the key appeared “fleshy” and was “pulsating” as POI-7543 held it. Mural Description: Libonotus is pictured as a young infant. His expression is jovial and his only article of clothing is a loincloth. He is shown eating food on a dinner table. The skeletons sitting around the table appear in poses that suggest laughter or bemusement. Notes regarding Key: Currently missing. First record of existence located in catalogue of Napoleon Bonaparte's anomalous item collection. Last seen during Marshal, Carter and Dark auction in 1954. Records indicate that key is made of human bone. Mural Description: Phoenicias is commemorating a festival in the middle of street. His age and features are ambiguous and the only discernible quality is that he is shown to be frowning juxtaposing his surroundings. Encircling him are other Greeks who are dancing and celebrating. Notes regarding Key: Currently missing. Phoenicias' mural has been completed since the construction of the Tower in ████ BCE. This mural has initiated the Amber-Level Event. Mural Description: Mural is in an extremely decayed state and no image is decipherable. Block Description: The block is absent from the mural. Structural damage around where the block should be located suggests that it was forcibly removed. Kant sensor array imaging has revealed that the internal structure of both the mural and pushing stone is controlled by a single large Antikythera mechanism. Noticeably, the mechanism is many times more complex than any other known mechanism of the same kind, containing hundreds of interlocking bronze gears and copper cogs. When a block is pushed in completely the now fully finished mural will intensely glow for approximately 30 seconds while an minor earthquake of magnitude 2.5 will occur. A block is only able to be pushed into the mural if it is unlocked with a corresponding key. As of 20██, three of the nine murals have been completed. After the earthquake, an anomalous weather or atmospheric event will manifest. These phenomenon will occur in a designated time period that is fixed for each separate occurrence. Foundation anthropologists and symbologists are assigned to study the images depicted on the murals and blocks, as they seem to imply what their particular anomalous weather event will occur when their murals are completed. The atmospheric events as a whole have been anointed the name Eos-type events. A Turquoise-Level Event is a recurrent snow storm that occurs semi-annually during the weeks of the winter and summer solstice. The anomalous snowstorm is best indicated by the gathering of cumulonimbus clouds moving abnormally quickly towards a centralized location, usually a populated or residential area. The snowstorm will usually emerge during midday and the onset of snow will usually take two days after the first signs of the event’s occurrence. From this point onwards the snowstorm will be referred to as SCP-3921-α. SCP-3921-α will usually last for approximately 90 to ████ minutes during which time the precipitating snow will be gray or black in color and the snow-bearing clouds will change from a normal white coloration to a maroon hue with the onset of the storm. The clouds will from now be known as SCP-3921-ω. The moment that a large mammal or human comes into skin contact with any of the snow generated by SCP-3921-ω they will be classified as SCP-3921-λ. SCP-3921-λ instances will then scan their surrounding area and attempt to cover themselves completely with any snow generated by SCP-3921-ω. If the SCP-3921-λ instance is successful in completely covering its body and face it will raise its hands in a cupped formation and gradually start to break apart into minuscule segments, while floating upwards towards SCP-3921-ω and will, eventually, be assimilated into SCP-3921-ω. At the end of SCP-3921-α, all gray and dark-colored snow will alter back to its original white tint and become non-anomalous. As well, all SCP-3921-ω instances will also change back to a white coloration and become non-anomalous. Testing of SCP-3921-α has revealed that the duration of SCP-3921-α is directly proportional to the mass of SCP-3921-λ instances assimilated into SCP-3921-ω instances, thus showing that SCP-3921-λ acts as a "fuel" for SCP-3921-α. The base duration with zero SCP-3921-λ instances subsumed has been determined to be 90 minutes. Mobile Task Force Xi-11 ("Frost-Freaks") are assigned to capture any SCP-3921-λ instances that remain after SCP-3921-α, especially wildlife, in the case that some instances do not become incorporated into SCP-3921-ω. Occasionally, witnesses of SCP-3921-α will recall that SCP-3921-ω will be escorted by a humanoid wearing a maroon colored cloak. An Amber-Level Event is a high-speed derecho which will from now be referred to as SCP-3921-ξ. A derecho is a widespread, straight-line wind storm with a length of 400 to 700 kilometers. Wind speeds of derechos reach nearly 210 km/h and are known for their particular ability to be able to topple large swathes of forest. SCP-3921-ξ occurs annually on the 11th of February. Areas affected by SCP-3921-ξ will seem to develop a red tint as the Amber event rains down non-anomalous red dust to areas it impacts. Humans who view the windstorm caused by SCP-3921-ξ develop an intense urge to celebrate the ancient Greek holiday of Anthesteria, which occurs on the same day as instances of SCP-3921-ξ. Humans who are impacted will celebrate in the outdoors and common activites shown by those effected are to drink copious amounts of alcohol and dance traditional Greek dances such as the sirtaki and kalamatianos. SCP-3921-ξ exists for approximately 24 hours and during that time all humans who are influenced will force those unaffected to stare at SCP-3921-ξ as it passes by. SCP-3921-ξ also possesses an anti-memetic property, causing affected individuals to have no memory of their actions during the event and will continue as they were before the event. Along with this, all structural and environmental damage caused by the wind speeds will be reversed by the end of the event. Foundation drone imaging have discovered that at the head of the derecho is a humanoid sitting on a cloud playing a lyre. Due to extreme wind speeds, the drone was not able to approach further. A Verdant-Level event is a gaseous vortex that occurs during the month of January. The vortex will now be further referred to as SCP-3921-φ. The occurrence of the SCP-3921-φ is confirmed by the formation of unnatural cloud coverage over a populated area, most commonly in the shape hollow semi-dome. SCP-3921-φ has been known, however, to encompass entire areas in a complete wind dome. Wind speeds during the vortex will usually range 150-200 km/h. However, this only occurs on the outer dome of the windstorm allowing the interior of the storm to be unaffected by the wind. This, effectively, makes entrance to the area impossible due to the wind speed and at the same time contains all entities inside SCP-3921-φ till its conclusion. The vortex will begin formation from 12 am to 6 am and its anomalous effects will materialize during the peak of the windstorm which normally occurs during noon. The cyclone will, therefore, last approximately six hours. During this time, the interior of SCP-3921-φ will start to emanate an anomalous viridescent vapor which has the effect of exponentially increasing cellular growth in organic entities and altering DNA structure in such a way that adaptations involving combat ability and mobility are proliferated. The vapor will now be referred to as SCP-3921-β. Non-mobile organic organisms in the kingdoms of Plantae or Protista will become both mobile and consciously responsive of their environment as their elementary DNA is altered by SCP-3921-β. Along with this, organisms in these two kingdoms will be affected by SCP-3921-β by direct contact unlike organisms in the kingdom Animalia who are only impacted if SCP-3921-β is inhaled. The mutated organisms will from now be known as SCP-3921-ζ. SCP-3921-ζ instances are known to consolidate into one entity, sometimes reaching to approximately 50 to 100 meters in height. This is, especially, common if SCP-3921-φ impacts areas with considerable forests or vegetation wherein huge conglomerates of SCP-3921-ζ instances will be amalgamated into one prodigious entity. When humans or any other species in the kingdom Animalia inhale SCP-3921-β they will immediately fall unconscious. SCP-3921-ζ instances from this kingdom will remain dormant until the end of SCP-3921-φ. After six hours, SCP-3921-φ will dissipate and SCP-3921-ζ instances are free to leave the area. Some SCP-3921-ζ have been known to be able to emit SCP-3921-β, thus, spreading the anomalous effects of SCP-3921-φ. MTF Beta-7 ("Maz Hatters") are assigned to the Northern Hemisphere and MTF Theta-4 ("Gardeners") are assigned to the Southern Hemisphere to terminate SCP-3921-ζ instances in the case that the containment procedures fail at terminating life-forms that are affected by SCP-3921-φ. Both MTF teams are required due to the rapid onset of SCP-3921-φ and its capability to occur in nearly any location. Listed below is an abridged version of SCP-3921-ζ instances and their distinct DNA and visual alterations. One human male 6 m, 205 kg Original skin has been permuted to be that of the shell of Spisula solidissim3. Height has nearly quadrupled with blood vessels increasing from normal 25 mm in diameter to 150 mm in order to expiate for height-weight discontinuity. Dissection of subject body has shown that vital organs and biological function have been rearranged arbitrarily. Subject’s physiognomy has been significantly modified and DNA analysis has shown it to be similar to Chondropyga dorsalis4. Digit phalanxes increased in length to nearly one meter edging off in curved point appendages. One canis lupus familiaris5 0.52 m, 30 kg While height has not altered from base organism. Subject has had almost half of its features replaced with those of Lithobius forficatus6. The length has increased five-fold to nearly 2.75 meters. The speed of subject has also increased to 30 km/h. The number of paws on the subject has increased from four to fourteen. Recommended to terminate these subjects first in order to prevent their escape. 237 Acer pseudoplatanus7 50 m, 4.55 t The aggregation of the subjects has resulted in the formation of a tractricoid8 shaped amalgam of tree trunks and branches. The main mode of transportation is to make revolutions around its main axis of rotation to roll in a specific, targeted path against other sentient entities. Talon-like claws line all sides of the curvature, which are used to hook and lacerate objects and individuals. Extremely volatile behavior of SCP-3921-ζ instance entails major damage if not terminated immediately. One human female 1.65 m, 62 kg No outer features have been altered. Organ structure, however, has been modified for efficient creation of SCP-3921—β. SCP-3921-β secretes from eyes and mouth. At least one type of this entity is produced for each Verdant-Level event. Live satellite imaging of the vortex has revealed that sitting at the apex is a humanoid covered in leaves. However, the humanoid demateralizes if ground drones attempt to go for further analysis. In classical literature such as Hesiod's “Theogony,” the "Anemoi" were commanded by Aeolus who is described as, "the keeper of winds." Despite Aeolus's importance in regards to the "Anemoi," there are no murals depicting him in the tower. 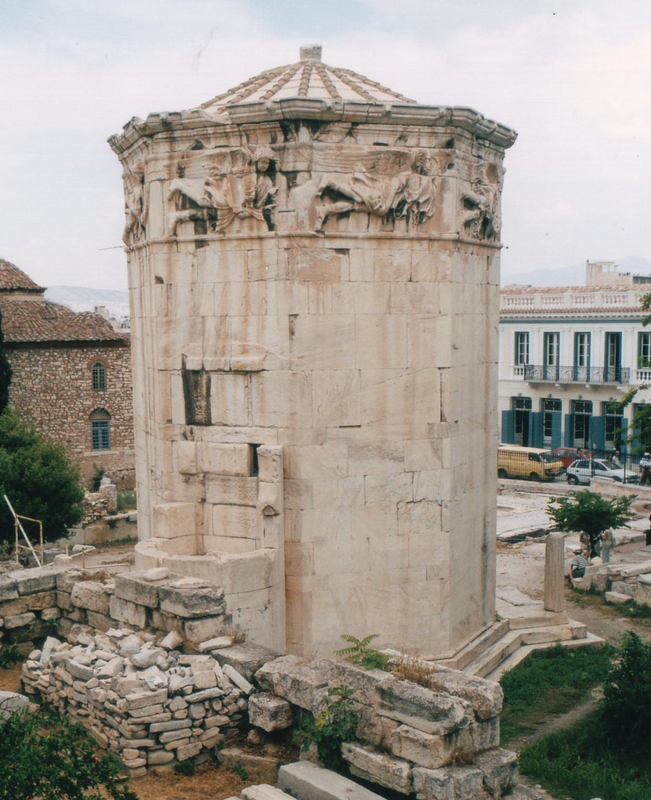 However, located on the capstone of the tower is a block with the words "αέρας αλλαγής"9 which is the epithet attached to legends of Aeolus. The block is protruding from the apogee of the tower and has no corresponding mural, rather only an image, similar to all other blocks. Additionally, these words are encompassed by a wind rose. The spokes of the wind rose become illuminated permanently when the corresponding murals located in the tower are activated since each mural is ascribed certain cardinal points. The block located on the apex of the tower, corresponding to Aeolus, has no analogous keyhole and analysis of the interconnecting lock mechanisms of the tower has shown that it can only be activated when all other murals have been activated. 1. Eos-type events are anomalous weather phenomenon caused by the completion of SCP-3921 instances. 2. A shallow bowl used by ancient Greeks to drink wine. 8. A 3 dimensional object wherein a tractrix is revolved around its asymptote. 9. Phrase in ancient Greek meaning "Winds of Change."